Dennie Hirsch sent in this pic. "This is myself (right), my mom Sherry Hirsch and sister Jenna Hirsch. 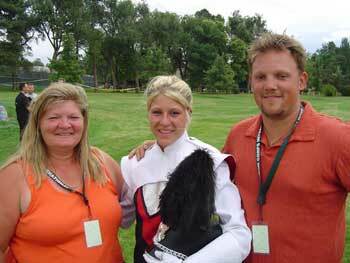 Another proud moment of my drum corps life was after Fusion made Division III finals -- and touring with family is always great. My mom cooks, sews, fund-raises, works countless bingos and is the vice president and a great mom to boot. "I am driving my sister down to auditions for the Blue Devils. I am sure she will be a shoe-in. Plus it will give me a chance to be a fan again. "My sister will be the last of four children to age out of drum corps. I led the way, aging out of Madison, then Ryan with the Blue Knights, Mitchell with the Strutters and now Jenna with a corps to be named. "Well I have always told everyone "It doesn't matter where you age out, just as long as you age out," it will be great closure for our family, but I don't see drum corps ever leaving us. It's just something that bonds people together and creates lifelong memories, friends, stories and happiness. Thanks drum corps! Thank you Dennie.